My timelapsing gear presently consists of two APS-C cameras: Samsung NX500 (with Samyang 12mm F2.0 NCS CS and Samyang 8mm F2.8 UMC Fisheye II lenses) and Ricoh GXR camera with its A16 (24-85mm) zoom unit. Comments on why I use these cameras can be found in the Introduction to time-lapse photography page, and my typical settings and additional comments on timelapsing with Ricoh cameras are here. Notes on timelapsing with the Samsung NX500 can be found here. Some of the timelapse movie files below are experimentally encoded using the H.265/HEVC compression (using ffmpeg x265 codec in VirtualDub2). As compared to older H.264/AVC encoding, these provide much better image quality, but may be smoothly playable on most recent, more powerful devices only. All the times below are given in UTC (GMT). Source of Suomi-NPP and NOAA-20 (JPSS-1) satellite data used on this page: NOAA CLASS. 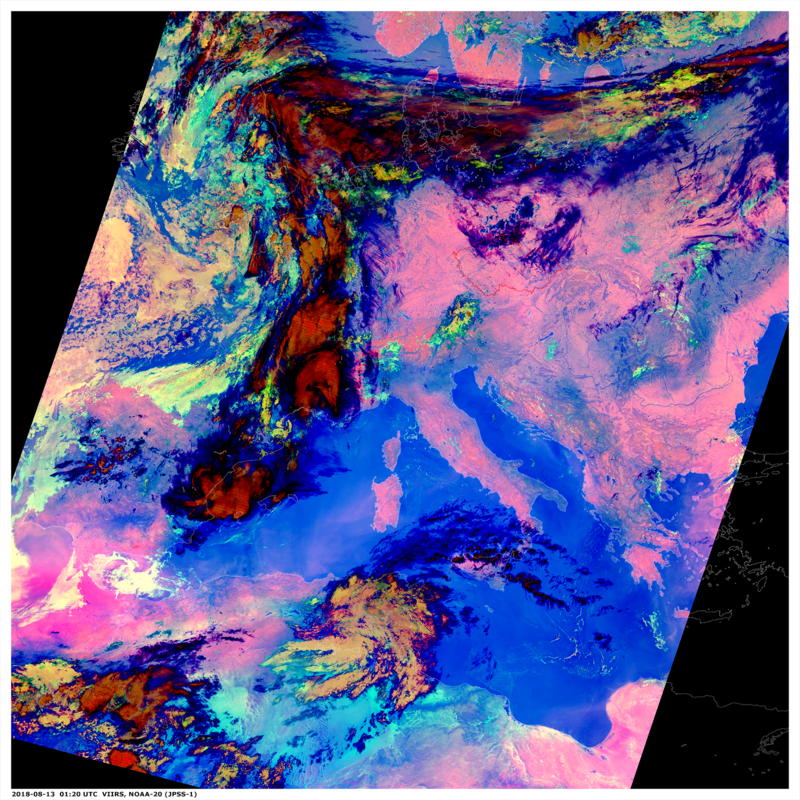 Source of MSG (Meteosat Second Generation) data and images: EUMETSAT and CHMI. 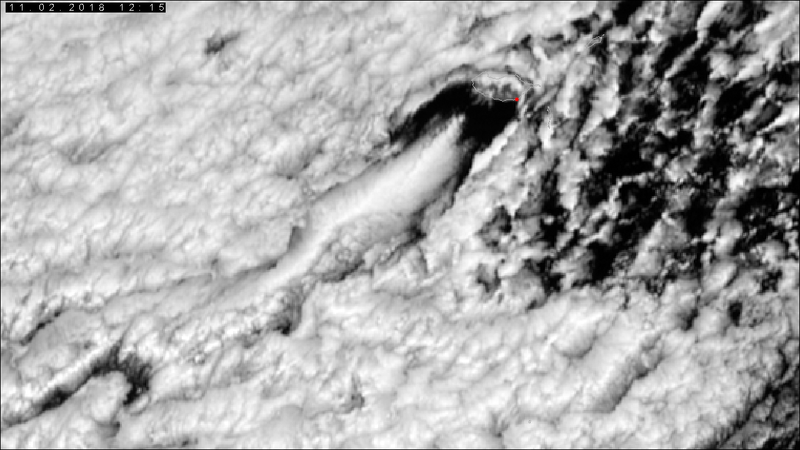 Cloud wakes forming downwind of isolated islands (such as Madeira) or groups of islands (e.g. Canary Islands) are rather a common feature in many parts of the world. 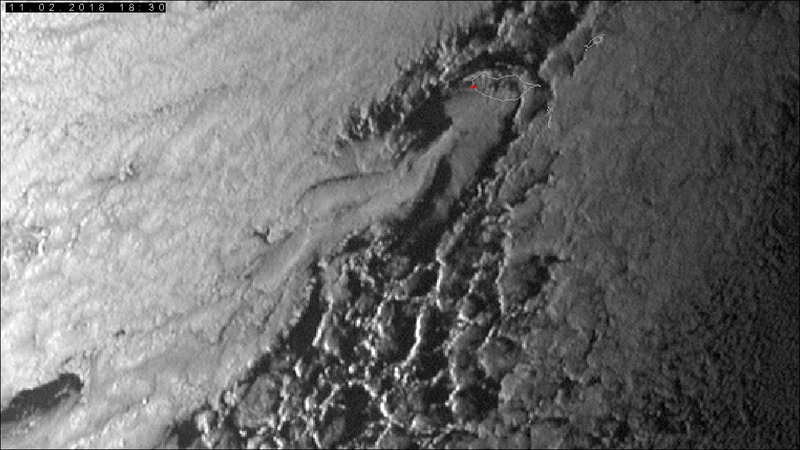 These cloud wakes can have a form of a simple cloud-free "gap" in the clouds, sometimes (as in this case) the gap can be partially filled by a cloud-plume forming inside the wake and often propagating upwind, towards the island. In many other cases clouds in the wake can form a series of smaller eddies, forming close to the island, which grow as they propagate downwind, away from the island (called Kármán vortex street, or just simply Kármán vortices). 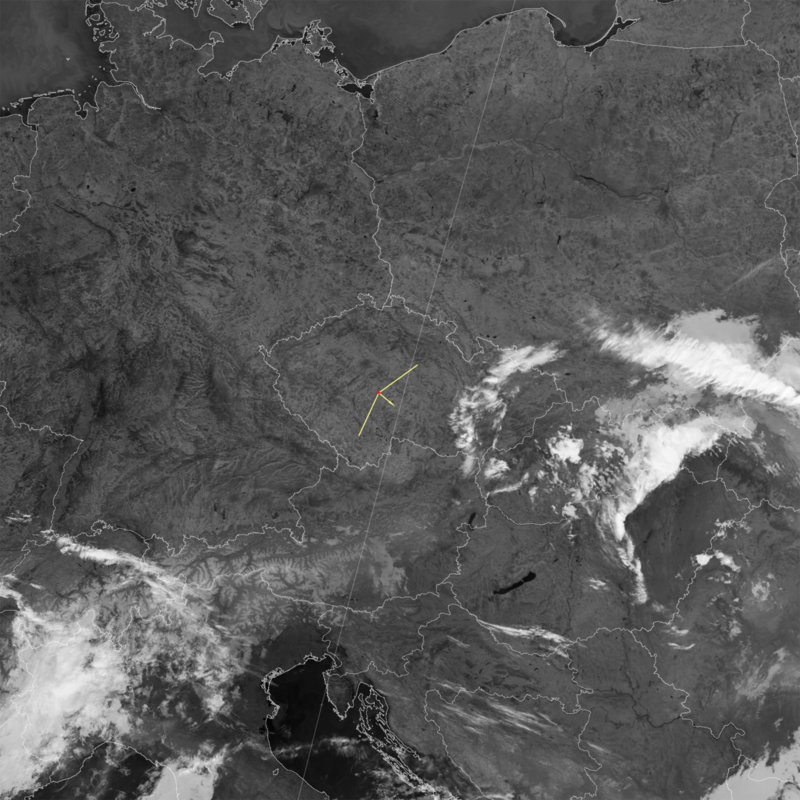 This case shows an example of such a cloud wake (the simple form), as documented by Meteosat-9 satellite, and also as captured from ground, in two timelapse series. See also the stand-alone HRV images taken at 12:15 UTC and 18:30 UTC, at times matching the two timelapse movies below. 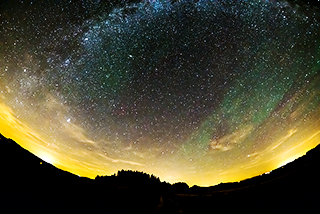 The red dots in these indicate locations from which the two timelapse movies below were taken. 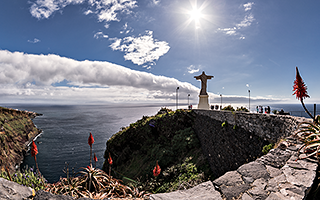 This timelapse sequence shows the eastern edge of the cloud wake, as taken from Garajau at the south-east coast of Madeira, 12:15 UTC, southward view. By this time, the eastern edge wasn't anymore as compact as earlier morning, and the "edge" had rather a wave-like structure. Some of the waves seemed to be rotating along their horizontal axis, as can be seen in later part of this sequence. 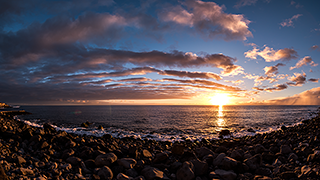 In this sunset to dusk timelapse sequence, taken from Paul do Mar at the south-west coast of Madeira (18:30 UTC, westward view), the camera captured cloud waves forming along the coast, roughly perpendicular to the western edge of the wake. The (partially precipitating) western edge itself can be seen at right part of these frames, just above the sea level. 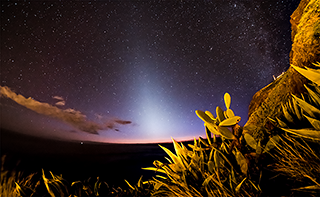 When planning our vacation at Madeira (when to go and where to stay), I was taking into account my desire to see and to timelapse dark nocturnal sky, in the evenings variegated by the Zodiacal light. 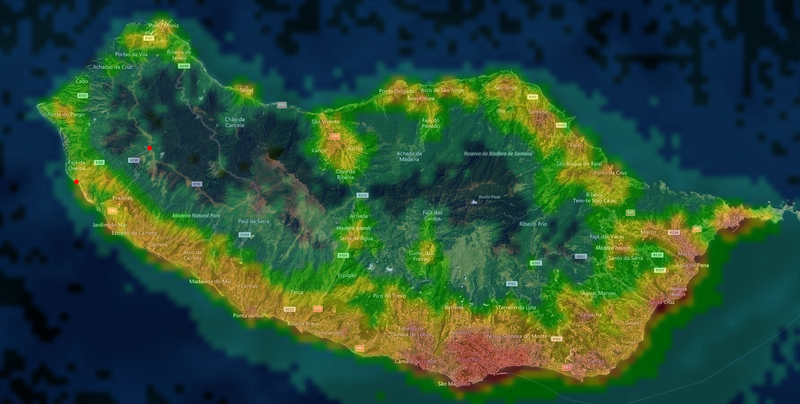 Since I knew that Madeira is rather suffering from heavy light pollution, namely at the southern coast, we were looking for a site which is not light-polluted as much as the rest of the coast. In the end, we decided to stay at Paul do Mar, a small town at south-west coast of the island (in this image indicated by a red dot on the coast). This timelapse movie was taken from a cliff some 150 m above Paul do Mar, where I was hoping to find somewhat darker conditions, escaping from the worst, the street lights. Though the sky above was more or less sufficiently dark, the lights of the town were still bright enough to illuminate the surroundings (and cast my shadow on the nearby vegetation, while irregularly checking my camera). 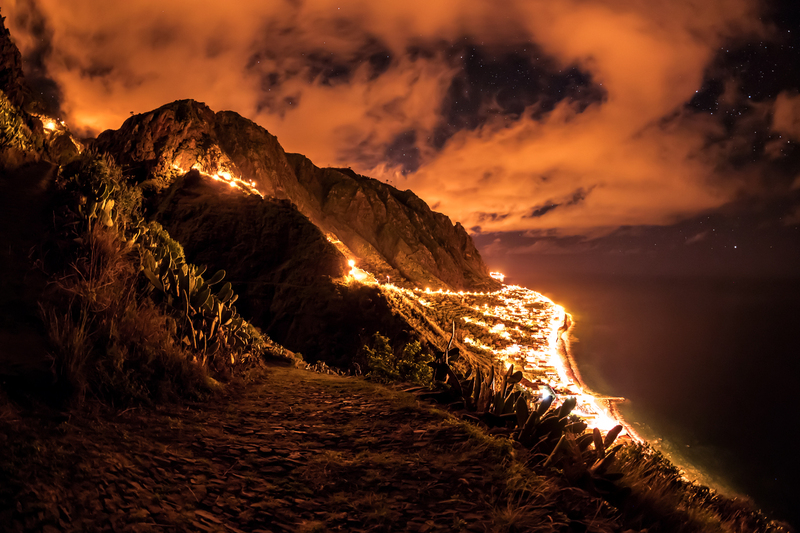 In the end, the illuminated cliffs, vegetation and clouds contributed nicely to the overall impression of this timelapse movie. 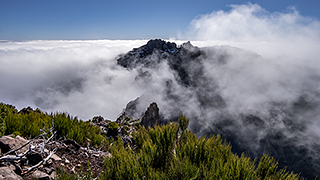 "Ocean of clouds" captured from Pico Ruivo (1862 m), highest mountain of Madeira, Portugal. The peaks in center of the frame are Pico das Torres (1851 m, the closer one) and Pico do Areiro (1818 m, the farther one). Despite the nice timelapse from the cliffs, I was still hoping for at least one clear night we could spend timelapsing from a location somewhere higher in the mountains. In the end, we managed to take this very short timelapse sequence of the Zodiacal light from an altitude of about 1300m (in this image indicated by a red dot inland). Unfortunately, the weather was unmerciful and has hidden the spectacular Zodiacal light (reaching some 70° high above the local horizon) by a thick layer of clouds. 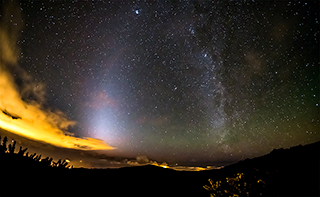 Besides the Zodiacal light, you may also notice the greenish airglow (nightglow), spreading from Zodiacal light to the right, lower in the sky. 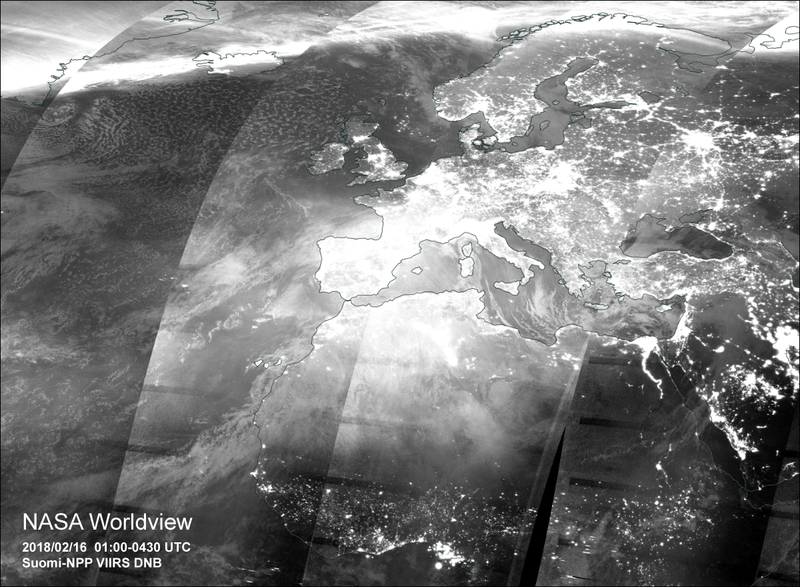 This nightglow can also be clearly seen in the Suomi-NPP VIIRS Day/Night Band image, as a much brighter featureless area over the NW Africa and SW Europe. 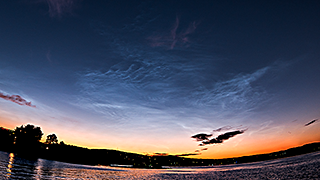 Very bright noctilucent clouds (NLC) and crepuscular rays above Oslo, Norway. Captured from Fornebu (southwest from Oslo), N-NE view. The standard mp4 files encoded in H.264/AVC (above and below) suffer from heavy "banding" in darker blue transition areas (x264 compression artifacts). This was the main reason why I tried to encode these with x265 (H.265/HEVC) codec, providing much better image quality, though these may be smoothly playable on most recent or stronger devices only. 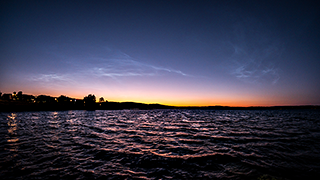 Weaker noctilucent clouds above Oslo, Norway. Captured from Fornebu (southwest from Oslo), N-NE view. Convection above Říčany. 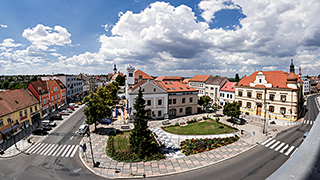 Shallow convection on a busy day above central square of Říčany (2018-07-26, westward view), and above eastern parts of the town (2018-08-26). Dedicated to my wife Stanja and her family, who lived for several decades there. The sequence starts with a shadow of the Earth and "Venus belt" ascending above the southeast horizon, as the Sun descends under horizon at the opposite side of the sky. 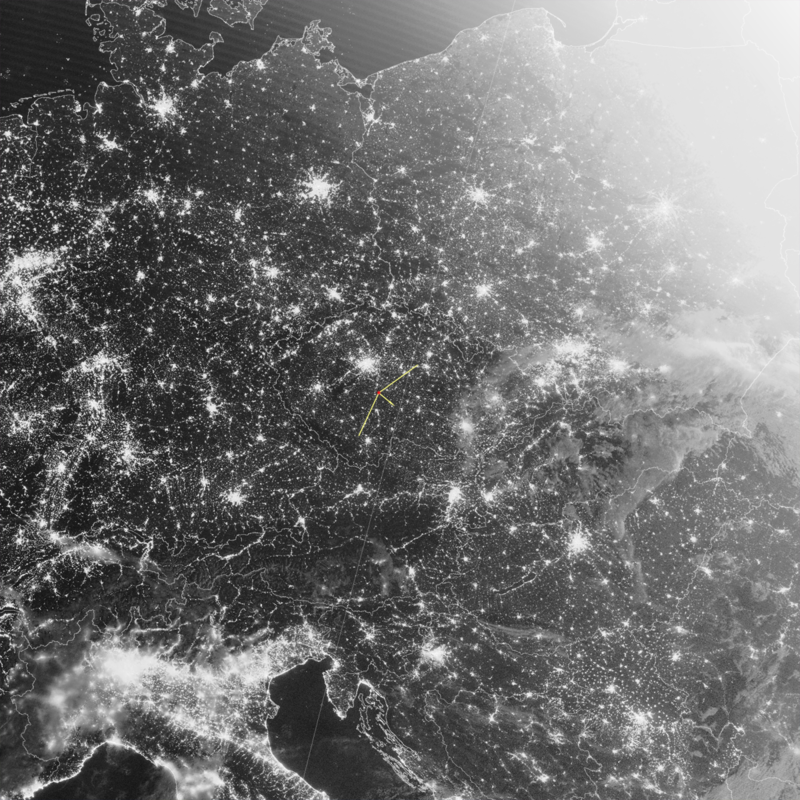 In this image, taken later in the night, you will find geographical range of the scene, planet labels, and names of towns glowing in the distance. 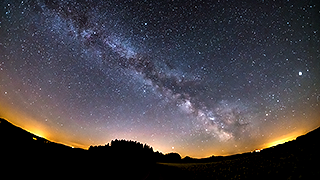 Besides the Milky Way, stars, planets, and many airplanes, you may also notice waves of a thin "mist", slowly drifting eastwards (from right to left in the sequence), best visible later in the night, namely at lower left part of the scene. Using satellites and other weather data, it is easy to verify that this "mist" is actually a weak nightglow (airglow of the night sky), and not clouds or aerosols. 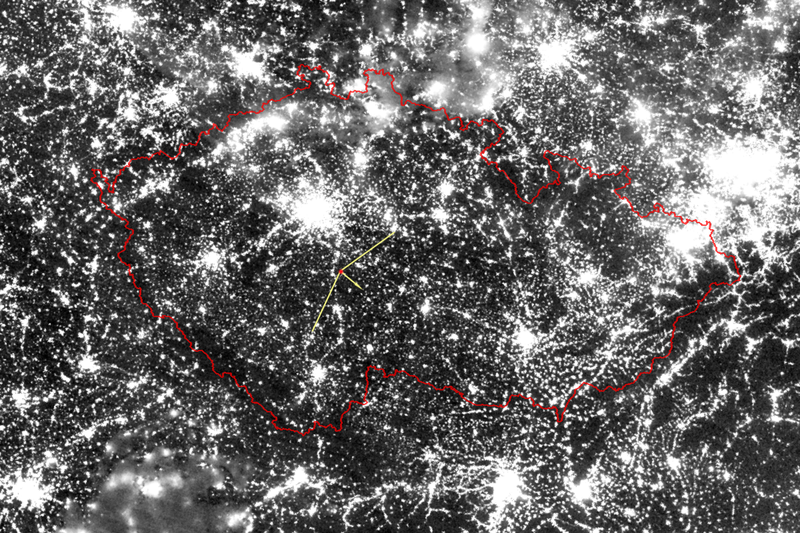 The NOAA-20 (JPSS-1) DNB image from that night shows location (red dot) from which this timelapse movie was taken (close to Jankovská Lhota, district Benešov, central Bohemia, with camera aimed at south-east direction), together with CALIPSO satellite ground track, mentioned next. The other two NOAA-20 images, M15 band and Night-Microphysics RGB product, show that the area was completely cloud-free, with some clouds towards east. The fact that the sky above the area was completely clear, with no clouds at all, can also be verified in this CALIPSO profile (vertical along-track cross-section, scanned by its CALIOP lidar; range of the NOAA-20 images above lies between 45 to 55N in this plot). 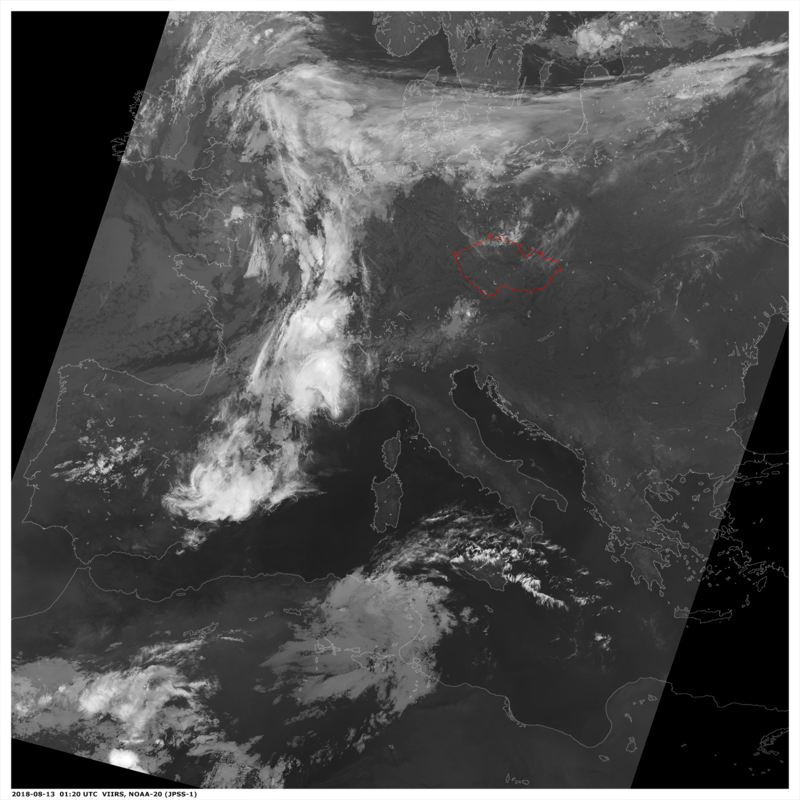 Atmospheric circulation above Central Europe is documented in these Meteosat-10 (MSG-3) rapid scan loops WV6.2, RGB 24h-Microphysics and RGB Night-Microphysics, showing that all clouds in the area were propagating from east to west - which is just the opposite to propagation of the weak airglow disturbances (or waves) seen in the timelapse movie. 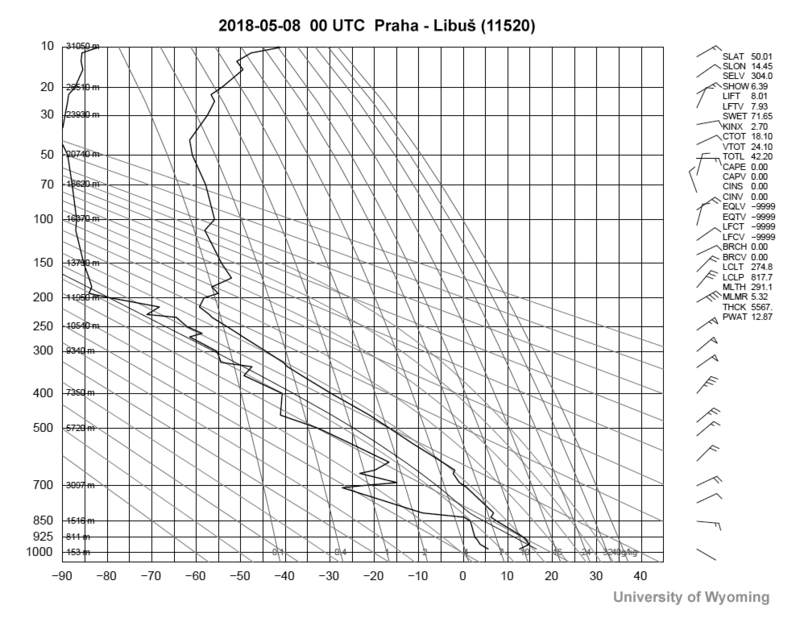 Another prove that all the winds in the area were just opposite to the motion of the nightglow, can be found also in this midnight sounding from Praha-Libuš, as well as in these wind profiles data. About three months later, I went to the same location to try a timelapse of Perseids meteor shower. The Perseids are very difficult to see in this timelapse movie, among all the planes cruising the sky. 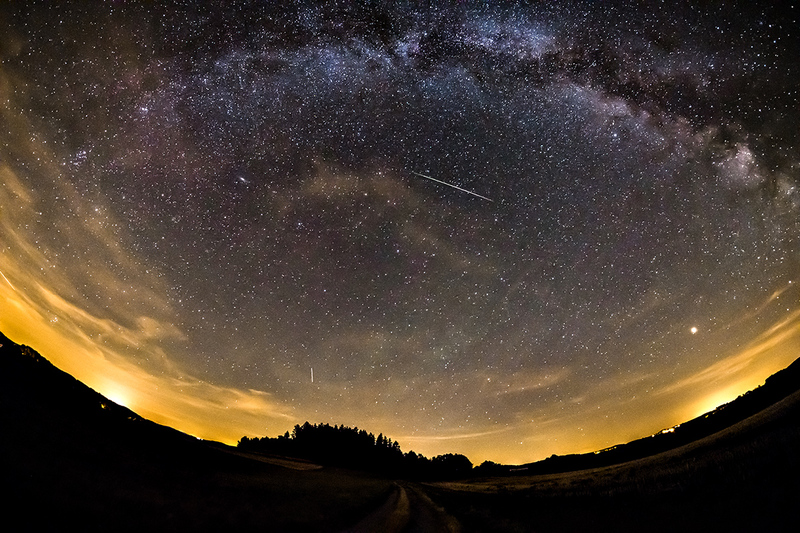 While the Perseids can be found in one single frame only (such as these: 21:57, 22:06, 23:38 and 01:47 UTC), airplanes and satellites can be tracked in several consecutive images. However, the night turned out to be exceptional because of a very bright green nightglow, which appeared later in the night, with its waves propagating from southwest to northeast (right to left here). Location and camera orientation are the same as for the previous case, and are plotted in this detailed DNB image (from 01:20 UTC of this night). 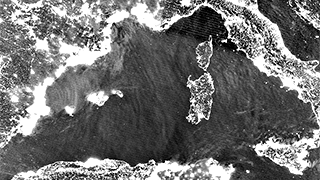 The NOAA-20 (JPSS-1) DNB image from 01:20 UTC shows that the airglow (nightglow) covered much of the European sky on that night. It can be easily seen above the Mediterranean Sea, from Spain almost to Greece. Also, comparing the DNB image with IR M15 band or NM RGB image (night microphysics), the waves of airglow can be traced also above the Bay of Biscay and south France, and also (as larger-scale bows) above the North Sea. 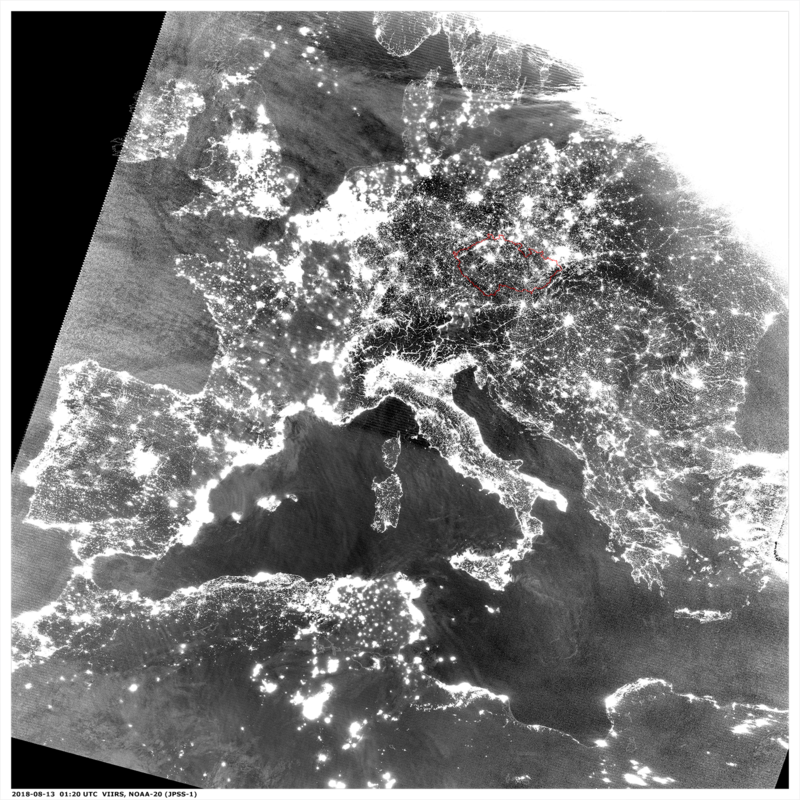 However, above most of Europe, the nightglow can't be seen due to strong light pollution (bright background). 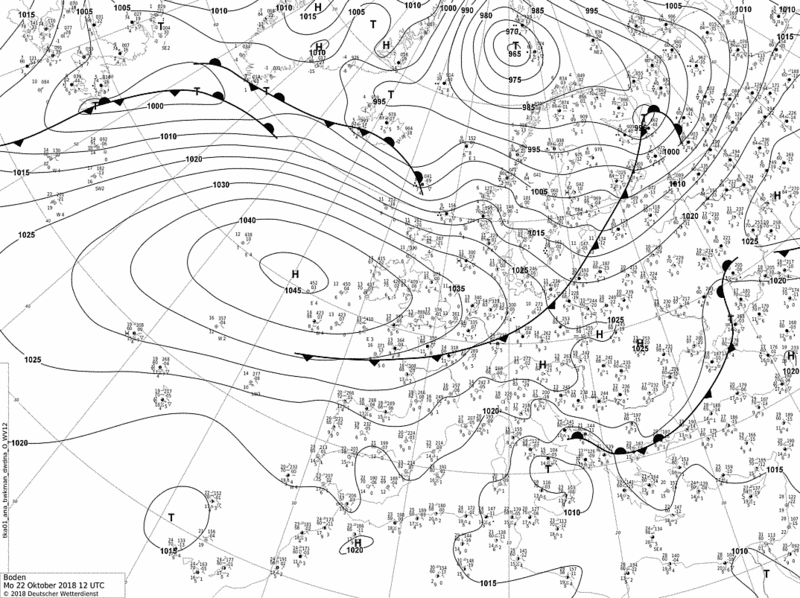 The MSG animations in IR 10.8 and WV 6.2 bands show that it was the strong convective activity above Spain and France which generated some of the waves in western and central Europe, while most of those found above the Mediterranean Sea are probably related to a jet stream above the region. 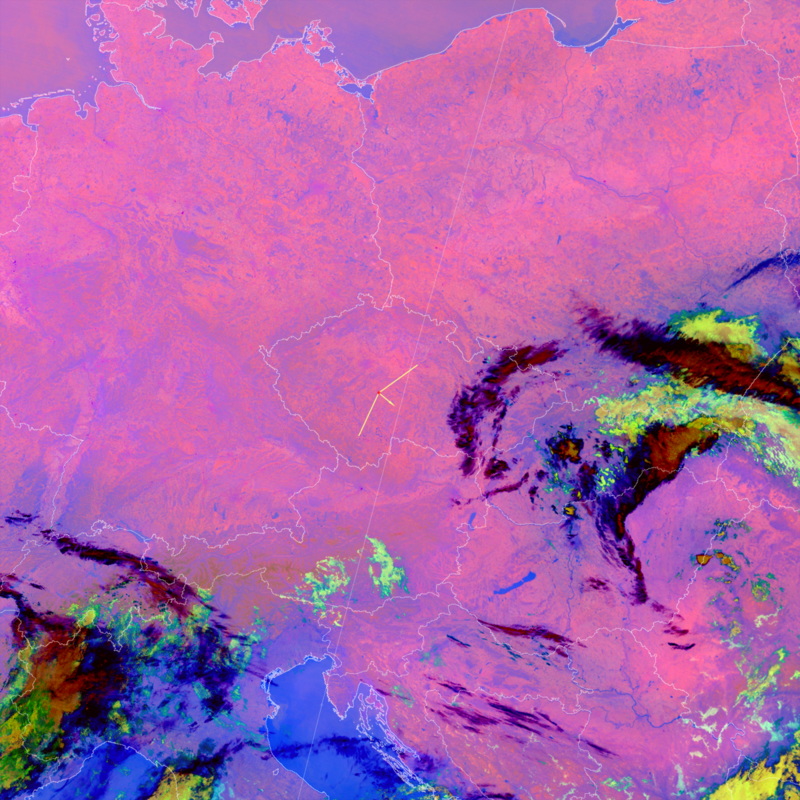 Finally, the RGB 24h-M shows details of cloud coverage of central Europe on that night. Farewell, warm and sunny weather! Cloudiness of a cold front, moving into the area from north-west, announcing the end of warm season of 2018. Captured from Průhonice park, district Praha-East, Czech Republic, with camera pointed to the northwest. See also the DWD weather chart, and these MSG loops: Europe (VIS-IR) for general overview, Central Europe (VIS-IR) and Czechia (HRV) for detailed view. In the last two loops the orange dot indicates place and time of the timelapse. Autumn colors. In this case nothing related to sky phenomena ... just beauty, amenity of fall forest, and its variability as the Sun makes its way on the sky. 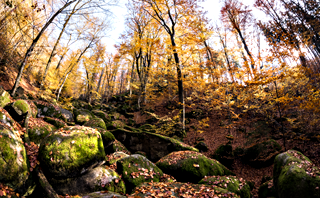 Captured at Vlčí rokle (Wolf Clough), near Prosečnice, central Bohemia.